Garsington removals. Whether you are moving house or need to relocate your office we have the experience to make your move as efficient as possible. We offer a range of packing services from a full pack to a bespoke package to suit your requirements. We supply all packing materials and will wrap furniture to protect it during transit. If you need storage we can arrange it for you, short or long term. We try to make every move go as smoothly as possible.We take notes during the viewing and pictures if necessary so nothing is left to chance on the day. Whether its dismantling furniture to get it down the stairs or having to take door off we will asses that on the day of the viewing. Parking will also be arranged by ourselves if you have a parking permit scheme outside your property in Garsington.Please beware there are no charges in Garsington for parking suspensions but in other counties this may not be the case. We will advise you on your options and help you plan your moving day. Our staff are reliable, friendly and experienced and will take every action to make sure your removal goes as stress free as possible. Your feedback is important to us to keep our reputation as reliable efficient and friendly removals and storage company where the client gets value for money. 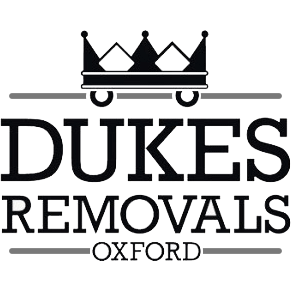 Dukes removals and storage is fully approved by Trading Standards and we are a member of their "Buy with Confidence scheme".